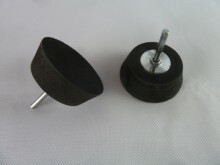 This mandrel is specially designed for woodturners with the 25mm thick pad made of a closed-cell rubber. This is just the right density to enable the pad to follow the contour of both the inside and outside of bowls. Using a Velcro attachment has definite advantages in terms of time saving as you no longer need to spend time individually gluing on different grits. The Velcro is a new and improved short Velcro which doesn't breakdown under friction like the conventional loop type. I recommend power sanding as it is far quicker, heats the work far less and eliminates radial lines left when hand sanding. This product is also available in a 50mm mandrel and a 100mm mandrel. Postage $2.40 to anywhere in New Zealand. Postage by quotation for overseas orders. Please contact timberly@xtra.co.nz. Click the button below to add the Velcro-Backed Power Sanding Mandrel (75mm) to your wish list.